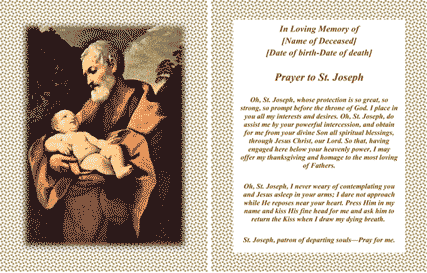 Saint Joseph holds the baby Jesus Christ in this free, printable church funeral card. A prayer to St. Joseph is on the other side, with space for the name of the deceased, their birthdate and date of death. Oh, St. Joseph, whose protection is so great, so strong, so prompt before the throne of God. and obtain for me from your divine Son all spiritual blessings, through Jesus Christ, our Lord. the Kiss when I draw my dying breath. St. Joseph, patron of departing souls—Pray for me.